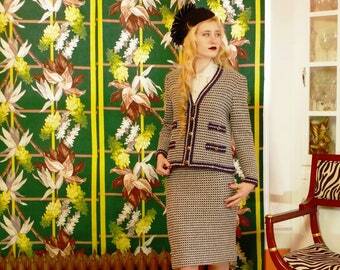 BEE BEAUTIFUL IN ELEGANT CHIC & EXOTIC VINTAGE FASHION! 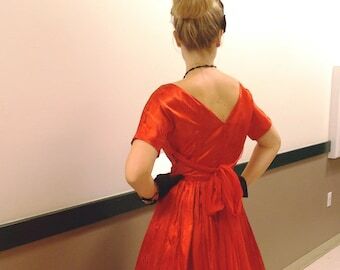 Vintage Valentine 60's Red Silk Mod Suit . Boxy Jackie O Jacket . Pencil Skirt . Nubby Shantung . Custom Tailored . Hidden Passport Pocket . Announcement *JAN 1 >>2019 Spend $98.00 total (after coupons) and get FREE SHIPPING on Domestic Orders. *NOTE! You can always request a split 2>3 payments to make your chosen item more affordable now! Just send me a convo! *NEWS!! To help you easily find dresses that fit, I have changed all my Shop Sections to waist size and all the measurements are clearly marked in the listings as well. 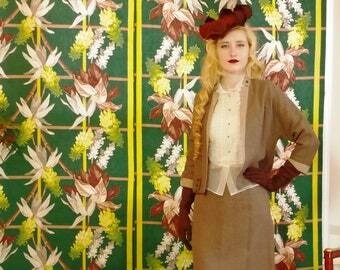 *WELCOME to my lovely curated vintage fashions. Why 'BEE' Beautiful Vintage?? The ancient Bee Goddess was chosen by a majority of my female students as a healing symbol for our time. 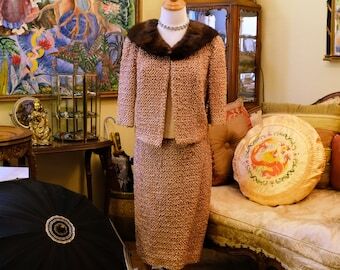 The bee is essential to the Web of Life, so as a woman of fashion who holds the future generations in her heart as something precious, I found the BEE as a potent avatar in the offering of well-made gorgeous vintage clothing and accessories. VINTAGE as an antidote to our throw-away culture, a way to re-cycle and value elements of women's history to Bee Green and Bee Beautiful. ***Come and browse the treasures! *JAN 1 >>2019 Spend $98.00 total (after coupons) and get FREE SHIPPING on Domestic Orders. Stylish Sixties Tweed Jacket. Vintage Boxy Mod Chic with Scholarly Tweedy Vibe. Brown Mink Collar. Day or Evening. Sporty or Office. Vintage 50s Dove Gray Peplum Suit . Sophisticated late 40's 'New Look' fashion . Pencil Skirt . Nobility Jrs. label . Women's Chic . Swanky! 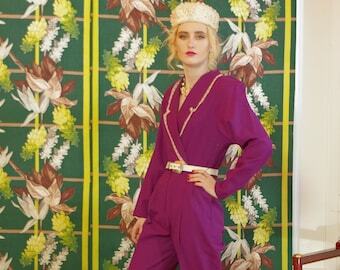 Classic Amethyst Purple 80's Jumpsuit. Feminine Lace Accents / Masculine Cut. On Trend & Modern Today. Eighties Rocker Pizzazz and Sass. Crazy Cool Vintage 60s Patio Pants Set . Turquoise & White Embroidery . Stan Herman of Mr Mort label . Tequila Sunrise Umbrella Tiki Time . Lovely dress, fit as described and looks better in person. Vintage Red Jacquard Jacket . 70's Exotic Hostess Lounge Wear . Orange Trim . Frog Closures . Bloomingdale's . Size Medium . Asian Kimono . I love this vintage dress. It fits me like a glove. It arrived very quickly and by coincidence, just in time for me to wear it for a trip south to a warmer city. I got compliments on my outfit, this dress & a vintage hat, that same day. I would definitely buy again. As a bonus, it also arrived nicely wrapped. I recommend the seller. David shooting some hats. Since he became the shop photographer the quality of photos has improved dramatically! Here I am styling Lyn to model a fantastic early 20th century Art Deco dress with a metallic gold lace peplum. Dreamy! Jane accessorizes Justine for an outdoor shoot with goodies I've collected. There is an invisible me behind the camera. Styling my newest model, Sarah with jewelry from my extensive vintage costume jewelry collection . Styling is my love. Who am I? I am a vintage green earth goddess loving woman. Vintage is the key word here. Back in the 50's, riding in the back of our families' fire-engine red Ford station wagon, every August on the way to Yellowstone National Park, I would dream and create exciting fantastical adventures... With myself as the heroine, of course. In the caves along the rivers I imagined finding treasures and exotic lost worlds, becoming their beloved Goddess dressed in luminous slinky dresses and radiant jewels (you've seen the movies, right??) Over the years I did travel to exotic places and my love of the history embodied in wonderful works of ancient artifacts, such as Tibet, Ireland and India, was born. So in my ETSY store: BEE BEAUTIFUL VINTAGE show cases a delicious display of vintage suits, coats, hats and dresses from the 20's thru the 80's and thematic vintage garments such as Boho Exotic, Mod, Western, Asian, WW2 and so forth.My other vintage shop in Etsy: LUMINOUS LADY VINTAGE will offer you the fruits of this passionate search for the shining vintage garments and treasures of this world that have a unique romantic allure and a wedding wizard section. At my art store; SHANGRI-LA TREASURES and Thankas, you can find the meditation iconic treasures to nurture the more exotic, luminous spiritual world in your heart. My husband David retired from his day job as a professor of Asian Philosophy to be reborn as a fashion photographer for the shop. He loves the challenges of photographing clothing and accessories and the playfulness of photographing models. 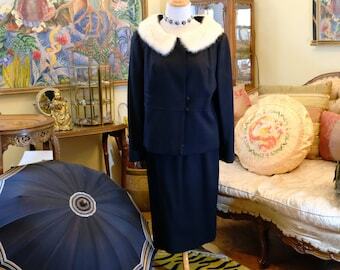 My sister Lyn keeps her eyes open for vintage fashion treasures and picks for the shop. We both collect vintage costume jewelry and go annually to the Antique Expo and on other treasure travel quests. Sometimes she doubles as a model for the shop. My model Cami is a total vintage lover, from her 1950s DeSoto car to her everyday wear. When she completed her university program here she was named "President's Scholar". Beauty, brains, fashion sense and mistress of vintage makeup and hair. Jane is a dear friend and creative force of nature. She steps in to help me as an assistant when and where ever I need it: wardrobe changer, model and adviser. She laughs a lot and keeps life radiant. Jeri is a dear friend who stepped up to the plate and modeled for me when I needed to get my winter coats listed. She was camera shy but David lured her into relaxing and having a great time playing dress up, so I bet she'll be back for more! Sara is my newest model, a Myrna Loy look alike with her soulful expressions and mischievous mysterious smile! Vintage, history and reading are her passions, which makes it fun to dress her up and style her in these fabulous clothes. Thank you for browsing Bee Beautiful vintage! The quest for personal treasures can be such a delightful endeavor and my goal is to provide you with vintage jewels in every sensual category, to weave dreams and spark fantasies, to value and preserve the history of women thru vintage clothing and accessories, to live Green by recycling and collecting well-made, gorgeous attire and to help you find your inner 'bee beautiful' in every sense of the word! here I offer some guidelines and policies to map out the more mundane aspects of the journey towards owning that transformational treasure. If you have questions about that special item, please contact me before purchase. Warm wishes that the info below is clear and helpful. *PLEASE SHOP WITH CARE AND ASK QUESTIONS, AS ALL SALES ARE FINAL! VINTAGE CONDITION CODES; DESCRIBED IN DETAIL BELOW! *Due to the fact all of the items are vintage, they are sold AS-IS, described in detail in the listing, though I often have repaired a seam or mended a flaw to do my best to send them to you in great shape! Items are usually dry cleaned, air and sun freshened or washed, ironed or steamed. But sometimes if the item is fragile, antique, or requires special expert cleaning I will sell it AS IS; in' Found Condition' (we have no access here in the small isolated town of La Grande to specialized cleaners) I do not know what or if any possible allergens the 'as is' clothes, hats, purses, shoes have been exposed to, (including smoke, though I NEVER buy anything on which I smell smoke!!) please consider these potential issues before purchasing vintage. *Those of you who know and adore vintage understand that some slight wear and tear in an item reveals that it was lovingly worn and cherished by the previous owner and do not expect "perfection". Even new old / new stock items may have minor issues. ***No refunds or exchanges for buyers remorse, wrong size/ doesn't fit, color variation due to computer monitor, color difference, etc. Please read item descriptions carefully, if you have any questions please ask BEFORE purchasing and I will be glad to research and answer to the best of my ability. * 2 WAY COMMUNICATION: You have contacted me to communicate your issue regarding the item and I have confirmed the return/ refund transaction. *Return the item within 5 business days of receipt and make sure the item is in the same condition and packaging in which it was sent. *All shipping costs are the responsibility of the buyer. I want you to have a wonderful shopping and receiving experience, lets hope the USPS guardian angels are with us!! At this time the only payments I accept are; 'PayPal' and Etsy; 'Direct Checkout'. See something you like, but need to wait till payday? Don't hesitate to ask us to hold it for you! We will gladly hold items for 7 DAYS. If you need longer than 1 week, please contact us to discuss possible further options or see layaway plans below..
Down payment on a reserved item is appreciated upon reservation. *To serve you better, Layaway is available on items over $100 ONLY, we can accept payments in installations with 14 day, 30 day and 60 day terms, depending on the cost of the item (s) you are ordering. * Items between $100 & $200 are eligible for the 14 day layaway plan with 2 payments. * Items over $200 are eligible for the 30 day layaway plan with up to 4 scheduled payments. * High-value items of $500 or more are eligible for the 60 day extended layaway plan with up to 4 scheduled payments. *We require a minimum $50 non-refundable down payment. *Please contact us with a link to the item you are interested in and the amount you will be able to put down initially and we will create a series of special listings for the initial & remainder of the layaway payments. *Making payments over a long extended period and/or paying in very small increments is something we prefer not to do. Thanks for understanding! *If you wish to cancel an order, do it ASAP, because I often send items out the day of the order. NO REFUNDS OR RETURNS once item has been shipped. *I ship USPS Priority Mail Domestic at least 2 times a week, excluding weekends & holidays. I will send you a confirmation convo that I have received your order and the shipping date. I then always let you know when your item has been shipped and will include the Tracking Number & Expected Delivery Date. *I take the utmost care in packing and shipping all my vintage treasures. I usually add a small Handling Charge into the shipping price to cover the cost of packing materials ranging from 50 cents to $2.00. I use both new and clean recycled boxes, envelopes & packing materials. *Shipping Charges in the listing are determined by: the size, weight and destination of the package. Items can be shipped more quickly if the buyer wishes to cover the extra shipping costs. If you wish me to ship USPS Express Mail, let me know in advance of the purchase and I will accommodate you by changing the rate. * I happily ship to International customers using First Class (under 20 ounces) when possible BUT If items are very large (over 36 combined inches) or heavy (over 4 lbs.) their are special USPS rules that allow things to be shipped ONLY; USPS Priority Mail International (6 to 10 working days) rather than First Class and that adds greatly to the expense. (unfortunately). * Our local Post Mistress has told me that once the item leaves this country, there really are no tracking systems, even when using the more expensive Priority and Express Mail and every country is different as to how they handle this. *No international package will be marked as a gift, all duties and customs charges, if any, and special rules (ex; Costume Jewelry to Spain requires Priority Mail and that means about $28.00 in shipping) are the buyers responsibility. International buyers need be aware of their own countries laws and regulations (ex; I know the customs are very high in the United Kingdom!!). *Your Paypal address and Etsy address must match unless prior arrangements are made. Will send to a gift recipient, when notified in advance and enclose a message card. VINTAGE CONDITION CODES: You mean it's not brand new? item still has its original tags/item has never been worn. If there is something amiss, I'll mention it. though looks brand new, it might have one thing amiss. dulled, etc. You get the picture, right? rhinestone or two, heel taps will need to be replaced. will need a dry cleaning to perk her up again. GOOD: She's seen better days but the party isn't out of her yet! kicking so don't give up on her yet. The LENGTH measurement for shoes is measured of INSIDE sole of the shoe from tip of toe to back of heel. WIDTH is widest INSIDE measurement. Please note, measurements of clothing in listings are not body measurements, please allow room for ease of movement.Clothing items are measured for the listing while the item is laid flat. You should measure a similar garment of yours that fits you well in this same manner to determine if a listed article will fit. If you need any further measurements please feel free to let us know. BUST/CHEST, measured from armpit seam to armpit seam, then doubled. WAIST is measured at the narrowest part seam to seam then doubled. HIPS are measured across the widest point approx 7 to 8" down from the waist then doubled. SHOULDER is taken across the back from seam to seam. TOTAL LENGTH is taken from center of neck in back to bottom hem. INSEAM LENGTH is measured from crotch/straddle to hem on inside of leg. RISE of pants is measured from top of waistband to center of crotch. Measure around your head where the hat would sit on your head comfortably. I hope for you to be a satisfied happy customer, one who will come back and browse Luminous Lady Vintage again. Please don't hesitate to communicate with me about any questions or requests. I will work with you, the customer on any problems that may arise. OFFICIAL ETSY FEEDBACK is greatly appreciated and I know you as a buyer, value yours also. To fulfill your order, you must provide me with certain information (which you authorized Etsy to provide to me), such as your name, email address, postal address, payment information, and the details of the product that you’re ordering. You may also choose to provide me with additional personal information (such as your body measurements, label or style preference for example), if you contact me directly. 2) I engage certain trusted third parties to perform functions and provide services to my shop, such as delivery companies. I will share your personal information with these third parties, but only to the extent necessary to perform these services. 3) Compliance with laws. I may collect, use, retain, and share your information if I have a good faith belief that it is reasonably necessary to: (a) respond to legal process or to government requests; (b) enforce my agreements, terms and policies; (c) prevent, investigate, and address fraud and other illegal activity, security, or technical issues; or (d) protect the rights, property, and safety of my customers, or others. I may store and process your information through third-party hosting services in the US and other jurisdictions (Etsy). As a result, I may transfer your personal information to a jurisdiction with different data protection and government surveillance laws than your jurisdiction. If I am deemed to transfer information about you outside of the EU, I rely on Etsy's Privacy Shield as the legal basis for the transfer. 1)Access. You may have the right to access and receive a copy of the personal information I hold about you by contacting me using the contact information below. 2) Change, restrict, delete. You may also have rights to change, restrict my use of, or delete your personal information. Absent exceptional circumstances (like where I am required to store data for legal reasons) I will generally delete your personal information upon request. 3) Complain. If you reside in the EU and wish to raise a concern about my use of your information (and without prejudice to any other rights you may have), you have the right to do so with your local data protection authority.